Many people around the world like climbing as their recreation. But there are a lot of confusions among beginners who want to know what climbing is. Climbing is the movement across vertical land like cliffs and mountains, including bluffs and rock and ice faces. It is a physically challenging activity that includes fitness and swiftness with the necessary mental strength to conquer a summit. Besides, when we climb, we can learn how to use our arms and legs in different ways. We also learn how to balance both our movements and lives. Climbing on the high helps to concentrate on giving the effort to move up a rock face, which requires a harmony of mind and body to succeed. It can be hazardous although it is often regarded as a positive phase of the adventure. Bouldering is a type of rock climbing usually performed on artificial rock walls that are known as boulders. It is done without the use of ropes or harnesses. It can almost be done without any equipment. Most climbers use climbing shoes to ensure safe footholds and bouldering mats to prevent any severe injury from falls. Buildering, known as urban climbing or sky walking, means the climbing activity which is done on the outside of the buildings and other artificial structures. If it is done without ropes or protection above the ground, it may be risky. Canyoneering is a type of climbing that includes hiking, scrambling, stemming, sliding and rappelling. It is the investigation of a canyon from point A to point B using skills and techniques. Ice climbing is the activity of climbing bent ice structures. Ice climbing usually describes to roped and secured climbing such as icefalls, frozen waterfalls, and cliffs and rock plates covered with ice frozen from the waterfall. In this context, ice can be divided into two ranges such as mountain ice and water ice. Indoor climbing is a popular form of rock climbing that is done on artificial formations to gather experience of outdoor climbing for beginners. The first indoor climbing gym was established in the U.S and Canada in 1987. Ladder climbing is a kind of climbing using a ladder for exercise. This may include climbing up and down. Lumberjack is a competitive pole climbing for speed using belts and spikes. Mallakhamba, also known as Mallakhamb, is a traditional sport that is originated in India. In this sport, gymnast performance, aerial yoga postures, and wrestling grips are done with a piece of vertical equipment or hanging pole, cane and rope. Mountaineering, also known as Mountain Climbing or Alpinism, and mountain climbers are usually known as alpinists, is the set of activities that includes climbing mountains. It also includes traditional outdoor climbing, skiing, hiking, etc. Sport climbing and bouldering are usually thought as mountaineering. Pole climbing is going up a pole which one can hold with one’s hands. The activity which is similar to pole climbing is called mast climbing. Mast climbing describes climbing a thing the same as a pole but having a larger width which ignores gripping with the hands. Climbers who see the activity as a gymnastic sport use only their bodies and arms without artificial assistance. Rock climbing is a climbing activity in which performers climb up, down or across natural rock structures or non-natural rock walls. The ultimate goal is to reach the peak of the endpoint a mountain or any other structure. It is usually a pre-defined path that is to be achieved without falling. Professional rock climbers have the target of either completing the path in the quickest possible time or gaining the extra point on a comparatively tricky way. Rope access is a type of work positioning used in climbing. Rope access skilled men ascend, descend and travel on the ropes. Scrambling is an action of walking up steep land including the use of one’s hands. It is a vague term that is between hiking and mountaineering. Canyoneering is often considered as scrambling. Sport Climbing is a kind of rock climbing that is done in competition by skilled climbers who must place protection when they climb. It gives importance to endurance, technique, risk, and self-confidence. Top rope climbing is a form of climbing in which the climbers are protected with a rope which then passes up. There is protection down the foot of the climb that’s why if at any point the climber was to lose his balance, he would not fall more than a short length. 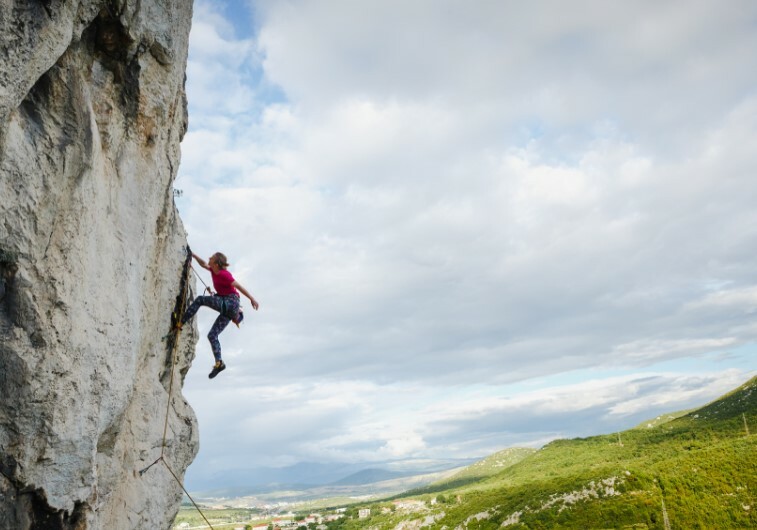 Traditional climbing, known as trad climbing, is a form of rock climbing in which a climber or a group of climbers set all necessary protection against falls. Solo Climbing, also known as soloing, is a form of climbing in which the climber climbs alone without the aid of any protection. It is usually done on higher walls. There are many types of solo climbing i.e. Climbing is the action of utilizing one’s body parts like arms, feet, etc. to climb a vertical piece of land. It is mainly done for recreation and competition. It also needs to be done in emergency rescue and military operations as well. Besides climbers also need to be careful to follow the plan, pay attention and have extra care about safety indeed.